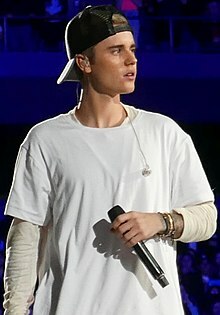 Justin Drew Bieber ( /ˈbiːbər/ BEE-bər, ojoibi March 1, 1994) je olorin omo orile-ede Kánádà. ↑ Farber, Jim (March 23, 2010). "Justin Bieber, 'My World 2.0'". New York Daily News. http://www.nydailynews.com/entertainment/music/2010/03/23/2010-03-23_rbpop_mix_on_my_world_20_cant_beef_up_justin_biebers_young_tone.html. Retrieved 2010-06-14. ↑ Greenblatt, Leah (March 10, 2010). "My World 2.0 (2010)". Time. http://www.ew.com/ew/article/0,,20350064,00.html?xid=rss-music-reviews-My+World+2.0. Retrieved 2010-06-11. Àtunṣe ojúewé yi gbẹ̀yìn wáyé ni ọjọ́ 6 Oṣù Kẹjọ 2016, ni ago 19:27.